Conor Sellars came of the substitutes’ bench to net a stunning winning goal as Tadcaster Albion beat Ossett Albion in the first round of the Integro League Cup. Josh Greening opened the scoring to get the Brewers off to a good start before Sellars’ screamer immediately cancelled out Tommy Wood’s equaliser for the visitors. Boss Michael Morton made three changes to his side following the loss to Skelmersdale seven days earlier, handing recalls to gloveman Michael Ingham, Jason Mycoe and Corey Roper, with Adam Baker taking his place among the substitutes. On a windy afternoon, Taddy almost got off to a perfect start inside the very first minute as Tom Corner saw his header flick off the post. The opening exchanges were fairly even, however, and Ingham, who was making his first start in six weeks, was called into action after 10 minutes when he made a good save to deny Sanchez Payne. The hosts then drew first blood just short of the quarter of an hour-mark. Pressure from a combination of Greening and Corner saw the latter play in the former and Greening carefully volleyed past the Ossett keeper and into the back of the net. 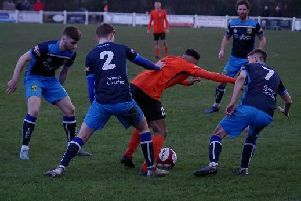 Former Scarborough Athletic forward Leon Osborne then looked to have a clear sight of Ingham’s goal ten minutes later, but Josh Barrett swept across to make a superb interception. Corner had two chances come and go in quick succession on the half-hour, one considerably better than the other. His first came from an Ingham goal kick with Cameron Murray nodding the towering forward in behind, but he dragged wide of the mark. With opportunities in front of goal drying up somewhat as the half reached its conclusion, the Brewers were forced into making a change when Pete Davidson pulled up with what looked like a reoccurrence of a hamstring problem. Sellars entered the field with a minute to go until the interval, but there was still time for one final chance before half-time, Corner volleying inches wide after good play from Corey Roper and Chris Howarth. After the resumption, Tadcaster really should have been out of sight after squandering two clear-cut opportunities inside the first five minutes of the new half. Sellars threaded a precise through-ball to an unmarked Greening, but he opted to try and pick out Corner instead of going alone and the Ossett defence read his intentions. Roper, who was impressing in the centre of midfield, then saw his low strike from distance spilled by Brett Souter and although Greening followed up, the Ossett stopper made amends with a good save. The Unicorns threatened for the first time in the second period in the 55th minute and came extremely close to equalising. Aidan Chippendale cut inside and curled a beauty towards the far corner, only for Ingham to get the faintest of touches on the effort which saw it incredibly strike both posts. Next it was Aiden Savory’s turn to have a go at the other end and he came increasingly close to doubling Tad’s lead when his effort was somehow kept out by Souter. Nevertheless, Ossett remained within touching distance and levelled with 20 minutes to go as Matt Dempsey’s free-kick was nodded into the back of the net by Wood. The two sides were however level for less than a minute as substitute Sellars sent a rocket past Souter from 22 yards to win it for the Brewers. Taddy should have made the final minutes more comfortable but Souter again was the thorn in the home side, keeping out Corner from close range. Five minutes from time, Oseett’s former Swansea City striker Jason Price controlled the ball and sent a brilliant half-volley into the net, only to be adjudged to have handled in the process. As the visitors pushed everyone up in search of a second equaliser, Savory was played clean through on goal and should have added number three but Souter came to his side’s rescue once again. The Brewers had already done enough though, and will tackle Cleethorpes Town in the second round of the competition.